So. I tried again. Different fabric this time as I had no black fabric to hand, but you know what- I love it! I bought this fabric for something else but I think it works for this also. What are your thoughts on the shorter length, the shape (I cut it into a fuller shape to create more ruffles), and the pattern? …and with the belt the other way around…. 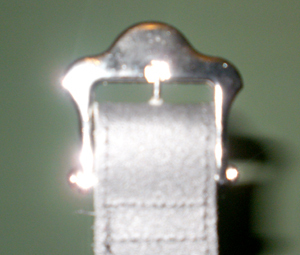 ….. and here is a close up of the buckle. I might try and close up the gap a little but there still needs to be some gap there to allow for size adjustments. Oh- and thanks again for the feedback! Oh this one rocks! It looks magnificent! Love it the second way round with the gap in the middle! That is awesome. I love the contrast the bright fabric creates, and the ruffles and length are great. I didn’t like the last one at all. This one’s fabulous! I like it! With the buckle to the front, it reminds me of some of the dresses being offered at Elloqui. Very nice! This one is perfect! I would definitely wear it! 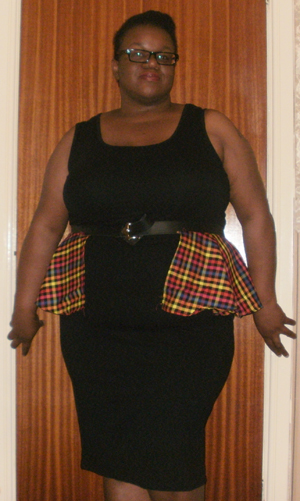 This peplum is 100% win!!! Love the plaid, love the shorter length, love the fuller ruffle, especially love the buckle in the front. 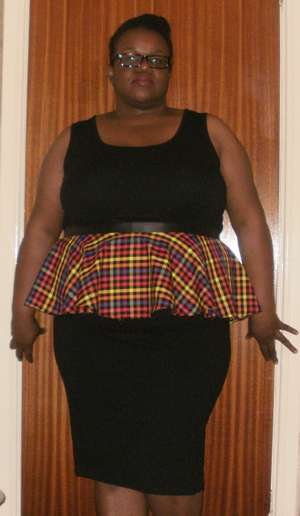 I really like this one, I love the color plaid splash the length & the fullness of the ruffle. I would wear it. Thanks! All your comments are appreciated! How clever! I’d wear it both ways. That would look even more awesome on a white background. Those colors would POP!